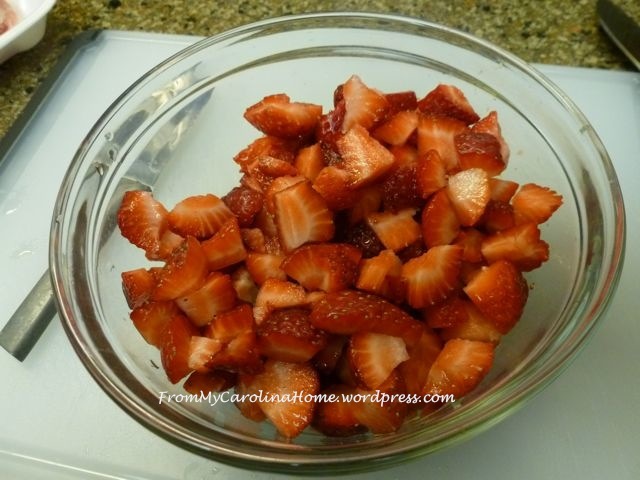 With the harvest season in full swing, and summer winding down, the strawberries are abundant. I wanted to preserve this last taste of summer in a breakfast bread, but the only recipes I could find used frozen strawberries. I wanted to use the fresh ones, so I had to develop my own recipe. This one came out right the first time, not something that happens often! As usual, the amount of cinnamon is geared to DH’s preference, but you could reduce it to one teaspoon for just a hint of cinnamon flavor if that is more to your taste. Don’t be afraid of the amount of oil, it isn’t any different than using a cup of shortening or butter. 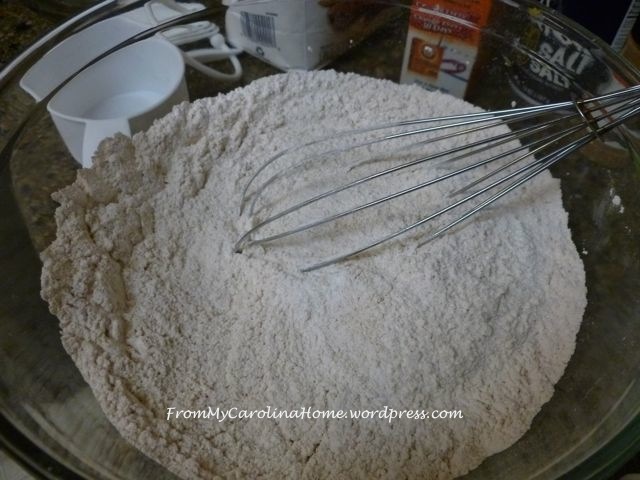 Combine flour, baking soda, salt and cinnamon in a large bowl and set aside. then cutting into bite size pieces. Combine eggs, milk, vanilla and oil in a bowl beating slightly to break up eggs. Add sugar and mix well. Pour wet ingredients into the dry ingredients. 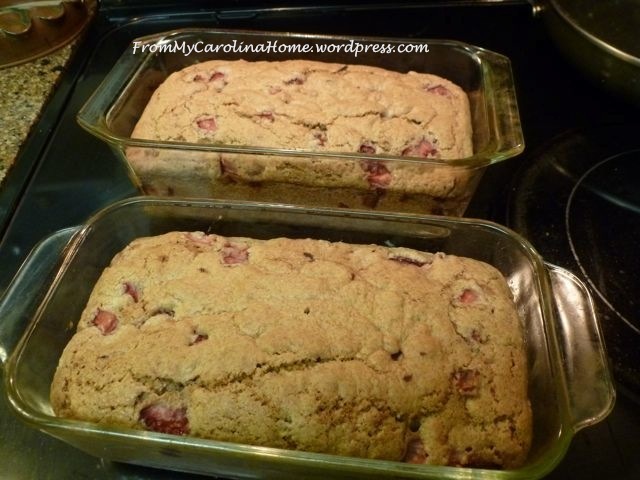 Pour into two prepared loaf size baking dishes. Bake at 350 degrees for 55-60 minutes, or until done. Don’t rely on a toothpick test, you’ll overbake them. Just bake until the centers are firm. 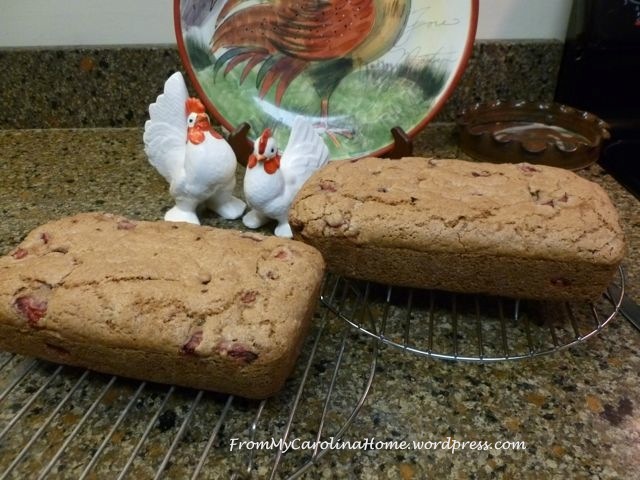 Let the loaves cool in their baking dishes for 10-15 minutes, then remove and set on a rack to cool. Yum! 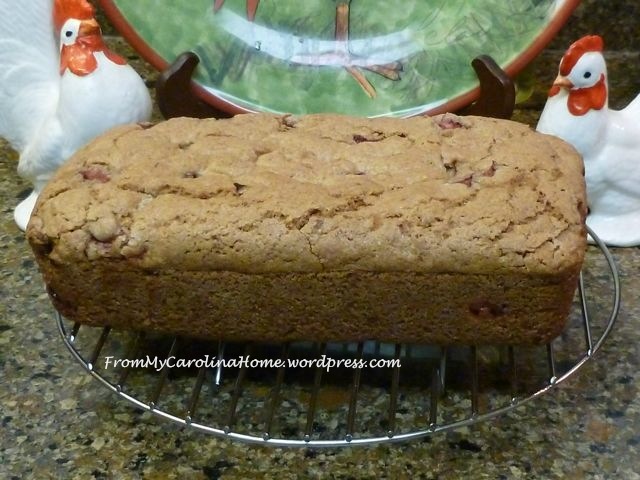 Serve with a little butter, or just slice and serve warm with nothing else on it. 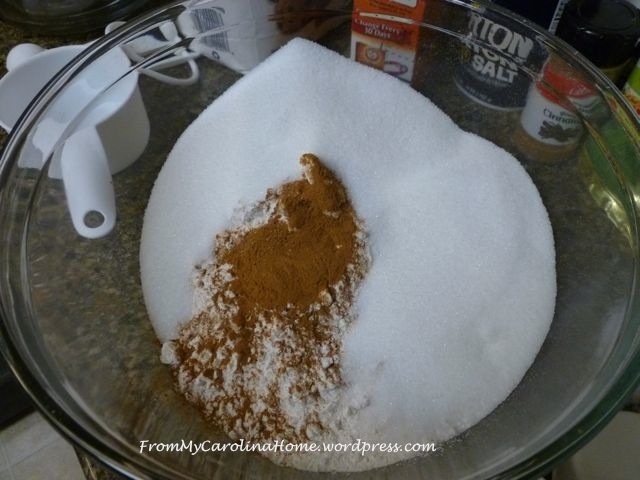 Combine flour, baking soda, salt and cinnamon in a large bowl and set aside. 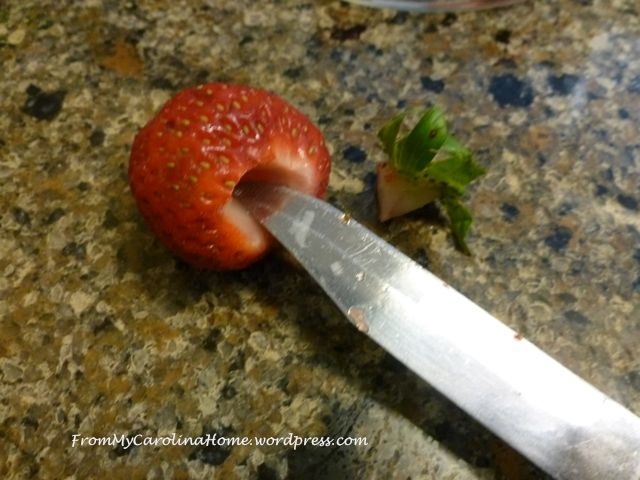 Prepare strawberries by removing stems and core, then cutting into bite size pieces. Combine eggs, milk, vanilla and oil in a large bowl beating slightly to break up eggs. Add sugar and mix well. 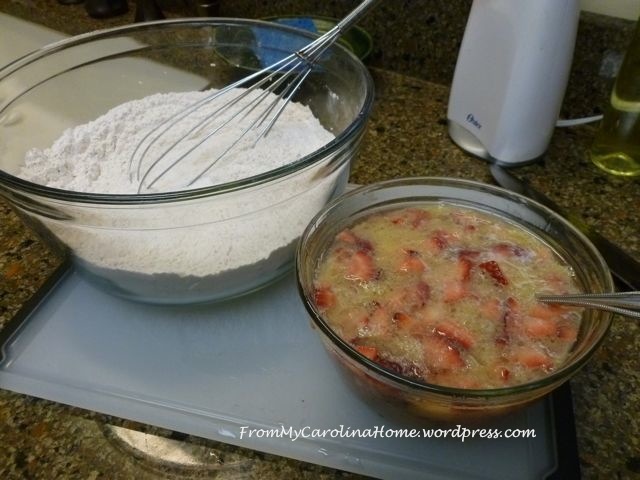 Add strawberries. 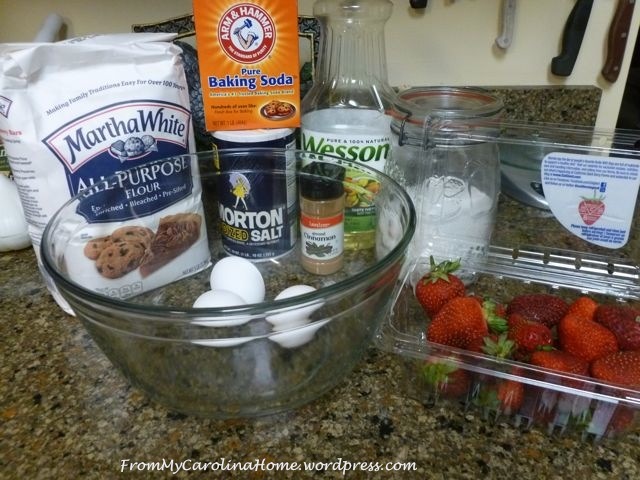 Pour wet ingredients into dry ingredients. Stir just until blended. 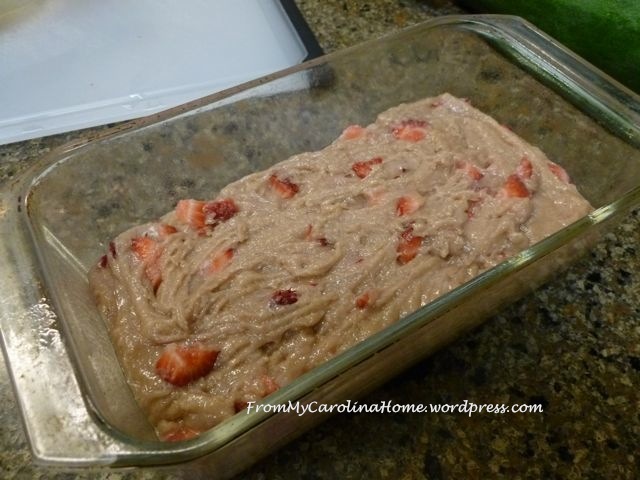 Pour into two prepared loaf size baking dishes. Bake at 350 degrees for 55-60 minutes, or until done. Want to do a great dessert with this bread? Layer thin slices with whipped cream and more fresh strawberries for a twist on the usual strawberry shortcake! I’m following your blog and oh! that’s so great! The photos from your Carolina, fabrics, quilting are very beautiful. 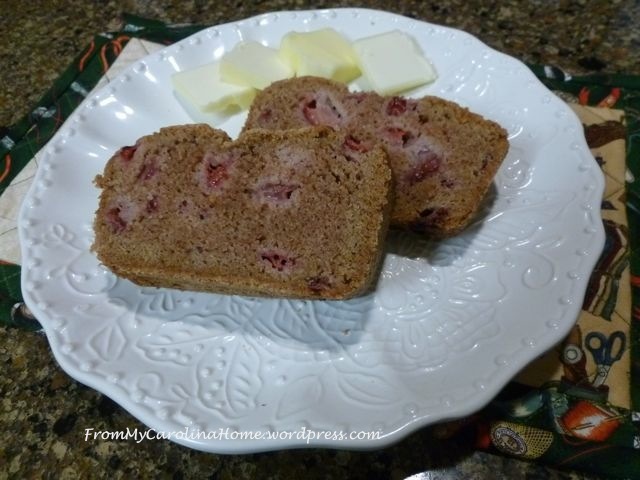 This recipe Fresh Strawberry Bread is all I need to start my day! Thank you for sharing. Rosemary, I tried to reply to you via email but comcast sent it back twice saying the email wasn’t valid. Thank you for your comment! This looks delicious! thank you!! Now you’ve done it! This needs to be made in my home soon…. Thanks so much Carole — sounds yummy! Okay, that looks yummy. I’m trying to stay focused on quilting, but you are making it difficult. Now I’m tempted to bake! Oh, wow, this sounds delicious! 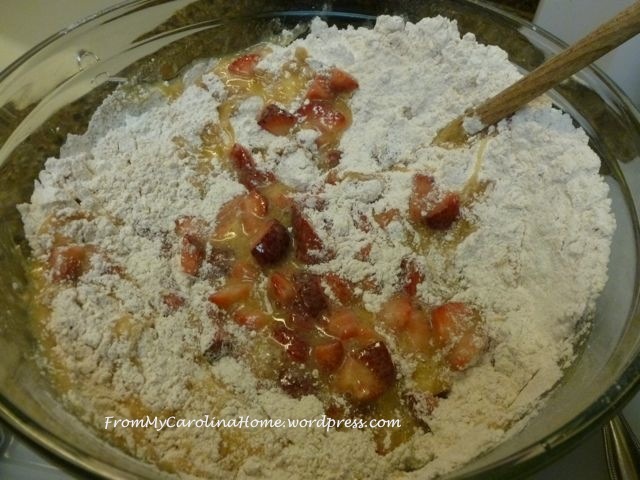 My husband and mom both love strawberries, so I’ll need to make this for them. 😀 Found you on the Project Parade. Thanks for sharing! Lovely loaves. 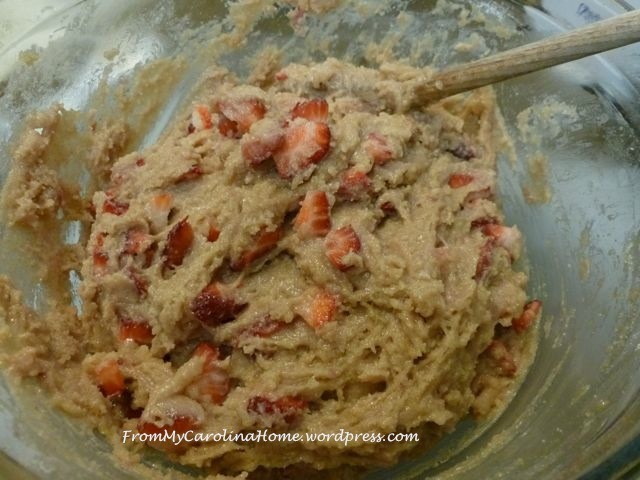 With strawberries coming in season, I can’t wait to try your recipe. Thank you for sharing.